This place, packed with people, food, cosmetics, herbs etc is a great and well-known establishment for everything concerning a healthy lifestyle. Located downtown in the neat and trendy 7th district, you can enjoy a tasty meal in a modern and bright area inside. Choose from the salad and antipasti bar or from the canteen-like area with warm dishes of strong Asian and Arab influences. Though not cheap, the food is really “yummy” and of superb quality. 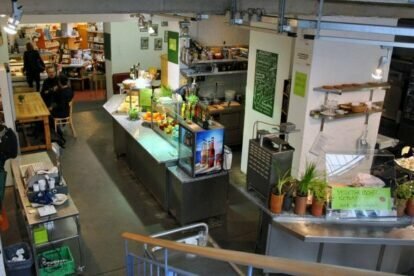 The atmosphere is special as it’s a funny combination of an ’80s health food store, an eco-chemists, a hippie self-service restaurant and a modern canteen. So when you feel the vitamins dancing in your veins after some antipasti, you can end up shopping for ecological shampoo, biological controlled cultivated seeds or delicious goat cheese from an organic farm.